This is an attempted reconstruction of a post I lost when the wifi connection at the hotel in Porto gave me problems. Don't get me started on the ripoff that is wifi in Porto. We woke Manny at o'dark thirty this morning and had him take us to the Oriente train station in Lisbon. Got there with plenty of time to spare and figured out what platform our train was leaving from, so we had a couple of cafes and relaxed beforehand. People in Idaho who have no public transportation options do not fare all that well with the myriad of these things in Europe. Up to a point, you can figure things out, but there's just so much that's left unsaid, assumed. Our train turned out to be about tweny minutes late after all, but we climbed on and a few hours later we were in Porto. (coolkids) We arrived at the Campanha station in Porto, and needed to get to the Sao Bento station there, so as to be within walking distance of our hotel, so we checked with the ticket office lady and she told us our ticket was valid all the way to that station, and which platform to stand on. When we got to Sao Bento, we found an information office across the street and got a complimentary map of the city and orientation and directions to our hotel. Walked to the hotel in very warm weather, and arrived sweating and ready for showers. Got checked in and cleaned up, then headed out for a walk around town. Our hotel was on the Praca de Batalha. 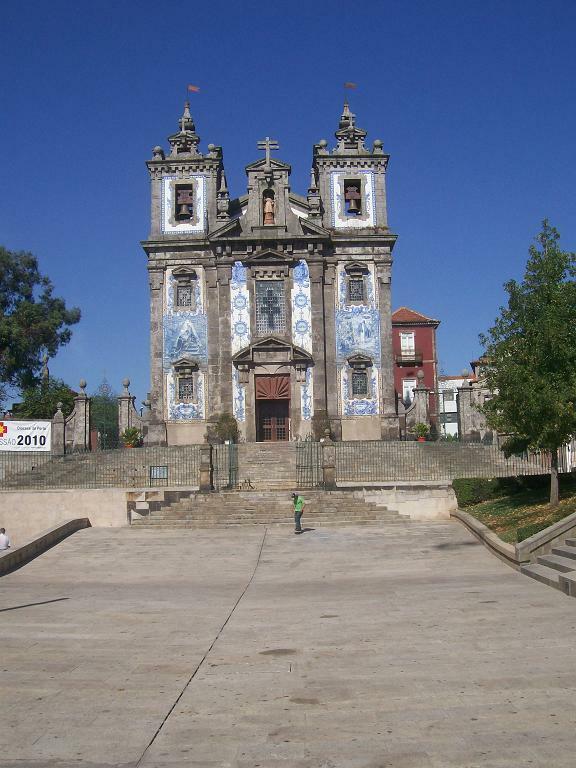 Nearby is the Igreja Santo Ildefonso, covered in blue tiles - we can pretty much see it from our window. turned out to be right around the corner from the busiest shopping street in town Rua Santa Catarina, so we strolled down there first, weaving amongst the crowds and avoiding the beggars. 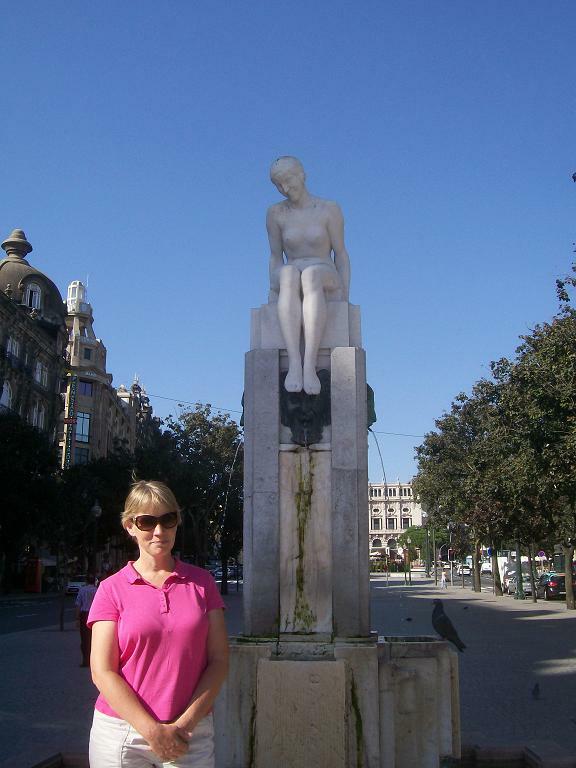 We walked up there several blocks before we turned west and headed a couple of blocks over to the Avenida des Alliados. (smalliados)There are many amazing buildings on the avenue, and the City council building is at the top of the area. There's a statue out in front of a famous poet of Portugal, who tried over and over and over to be elected to the council. After he died, they still kept him outside. At the bottom of the square, of course, is the mandatory "guy on a horse" statue, commemorating a hero of battle. We wandered the city most of the afternoon, and relaxed in the hotel room in the evening, after a meal of fresh fruit and cheeses.